You are currently browsing the tag archive for the ‘pencil drawing’ tag. Last week as we walked out of Target to the parking lot, what do we see but a large black bear wandering around. He clearly had forgotten where he was parked. We respectfully waited until he found his car and drove off. 🙂 My sister said that bears also want good quality at affordable prices. Did I mention I’m over bears? He eventually ran into the woods and we got in our car and drove away. If your job is to install traffic and street signs and you don’t see the GLARING TYPO in this sign, perhaps this job is not for you. Since I am a civic minded person, I wrote to the city to alert them of this issue which, admirably, they fixed the next day. So shout out to them! The above drawing was done using a method called automatic drawing. 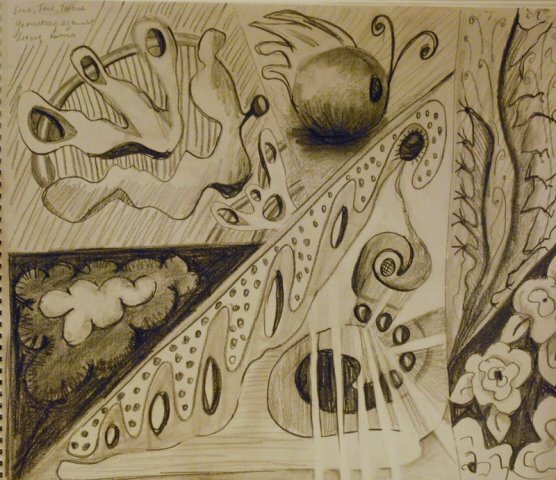 Automatic drawing was started by the surrealists to free themselves of representational art. I believe the first person to do it was the artist Andre Masson. We started by taking a pencil or two (one in each hand) and just making lines without looking or thinking. 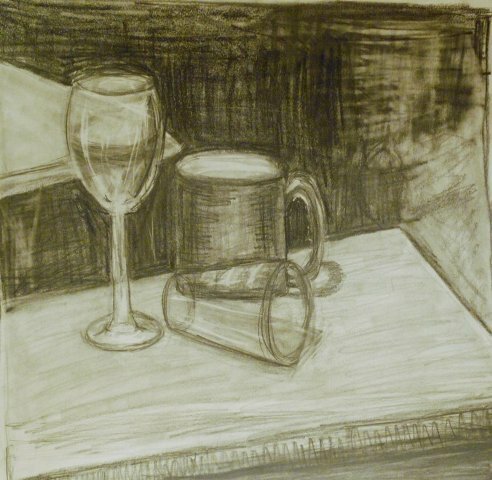 This is different from blind contour drawing, which is drawing while looking at the object but not at the paper. Once we had some lines on the page we went back and this time, since it was a botanical drawing class, we looked for shapes that could be plants, leaves or flowers and drew back into the lines. It was great fun and I will do it again. If I were a cop…or Officer didn’t you see that car chasing me? There are many times when I wish I had the authority to arrest someone or hand out summonses. Just because people annoy me. Not YOU, gentle reader, but the people on the subways, in traffic or on the streets. Many years ago, before The Husband actually became a NYC police officer, he and I took a NY State court officer test. This was a written test and if one passed the test it would be followed by a physical and psychological test. We laughed because we KNEW no one in their right mind would give me a gun. C. I really don’t look good in dark blue polyester. The Husband finally took the NYPD test and the rest is history. Which brings me to last night’s dog walking conversation. COP: Did you realize you were doing a zillion miles an hour in a 30 mph zone? CHARLIE: (pulling his response from a place where the sun doesn’t shine) Didn’t you see that car that was chasing me? COP: Yeah, right, whatever. Here’s your ticket. You can dispute it if you like. JUDGE: Were you speeding on the West Side Highway? CHARLIE: There was a car chasing me! JUDGE (to Cop): Did he say there was a car chasing him when you pulled him over? Well, that was a long story to talk about the above drawing. It was part of the drawing class I took with The Sister and The Nephew. 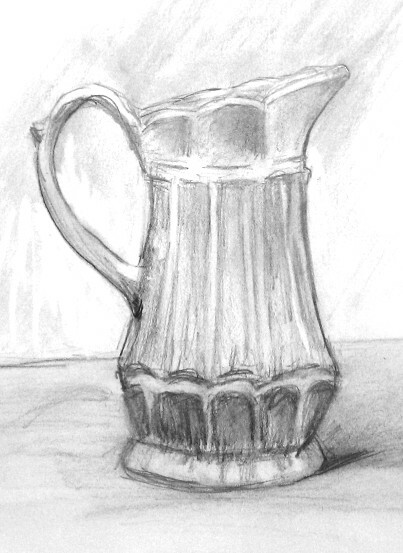 The assignment was to do a 30 minute drawing of 3 drinking vessels. I was so focused on getting the glasses correct that I didn’t pay attention to the table. Once I looked at it from afar I realized those 3 drinking vessels were going to slide right off the table. What was I thinking? Where was a cop when I needed one? He could have said “Stop right there ma’am, you’re going to fast.” My response? Didn’t you see that clock that was chasing me? I remember one time many, many years ago when The Husband, The brother-in-law (the Husband’s brother) and I went to see an off, off Broadway show called “Smoking Newports and eating French Fries”. We went to the show based on the title, cause really, how could it be bad? It was so bad we walked out even before intermission. The Husband drinks TONS of coffee. He is the epitome of the cop drinking coffee stereotype. He will make a pot of coffee in the morning, drink it all, go to work, drink more coffee and then come home and make coffee before he goes to bed. I have MAYBE one cup of coffee in the morning. Sometimes. The best coffee EVER is to be found in the Caribbean, Central and South America. Give me a cafe con leche any time! I remember one time when the aforementioned brother-in-law was living in Seattle and came back for a visit. He brought his own coffee. It was right at the time when the whole West Coast coffee Starbucks snobbery was starting and I was HIGHLY insulted. Really Jimmy! I have never forgotten that! So here’s to coffee! I like mine with milk and sugar. If I have a stroke I’m gonna be really pissed! One Saturday morning at drawing class, the teacher wanted us to loosen up by doing an abstract drawing. This is what I ended up with. And you know what? I really liked it. And you know what else? So did the teacher. I knew this when he whispered to me that mine was his favorite. My sister a/k/a “Big Ears” Alice overheard this and proceeded to call me “teacher’s pet” the rest of the day. This was funny because since I was kicked out of kindergarten for (allegedly) spitting on the teacher and then spending the next 12 years hiding from and not being fond of (to put it mildly) the nuns and lay Catholic school teachers, I have never, ever been known as the teacher’s pet. I’ve spent the week reclining on, to quote Warren Zevon, “the davenport of despair.” Deaths, illness and stress have me in a no-fly zone. And don’t even get me started on Japan. I see that and I want to hit myself for feeling sad, but who says this makes sense. It doesn’t. At least Charlie Sheen has been keeping me amused.